Robert Pacheco submitted this photo and caption. 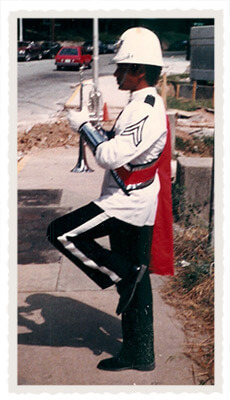 I was cleaning out my closet and came across this photo of me in my Phantom Regiment uniform. I believe it was taken in Atlanta at a DCI regional show in 1983. I had the distinction, so I was told, of being the only member from New York City to have ever marched in the Regiment – up until that time of course. I am still a fan and love drum corps more than ever!